One of the most unique and ancient traditions of Hinduism is the tradition of Guru or Master. A guru is considered in Hinduism as God himself in human form and accorded the highest respect in the social hierarchy next to parents. A student is expected to pay utmost respect to a Guru and please him so that he would qualify himself to earn his grace and obtain spiritual knowledge. Hinduism is a complex religion with no central authority and no governing body to codify and regulate all the teachings. The religion has been sustained and nourished for centuries by the tradition of the master and disciple (guru shishya parampara), where the master would take up the responsibility of passing on his own verified and experiential knowledge and the textual knowledge of the sanatana dharma to his trusted and tested disciples who would continue the same process down the line. The religion survived and strengthened its roots through this process for centuries and survives even today on the same principle. Modern technology today offers the facility of printed books and self-study courses and guides. But from a practical and spiritual point of view, true understanding of the Hindu scriptures can be known only through the grace and blessing of a guru. Gurukula was the place where the master stayed with his family and students and continued his tradition of teaching to the aspirants the subjects in which he had mastery. Practically, they were private schools, admission into which depended upon several factors, in the beginning personal merit and in the later days caste and family background. In the olden days knowledge was passed on from one person to another in the form of oral teaching and memory intense repeated recitation. There were no written scriptures in those times and so only memory and a knowledgeable guru served as the main and authoritative sources of reference. Even after the emergence of a written script, very few people had access to or could afford to possess written literature. Besides, the scriptures discouraged imparting the religious knowledge to the unqualified, ignorant and untrained minds, due to the possibility of such knowledge being misused for harmful and selfish purposes. So the only way knowledge could be passed on from one source to another was through personal contact or oral communication. Both necessity and circumstances established the master disciple tradition as a convenient and reliable method of preserving the religious knowledge and ensuring its continuity. But memory and oral communication being such unreliable instruments of education, certain safeguards became necessary to ensure continuity of knowledge and preserve the scriptures from being corrupted through bad memory or sheer carelessness. The first and most important safeguard concerned the character and personality of both the student and the master. The scriptures expected the Guru to be a person of highest moral, mental and spiritual standards. Without inner awareness and necessary spiritual enlightenment, claiming the seat of a master was considered an immoral and socially unacceptable act as an unqualified person would not only corrupt himself, but also lead the students astray with his ignorant teachings and inadequate preparation. A student was also expected to be of a decent character, with a lot of good karma and earlier preparation from the previous births and possess a decent family background. Unfortunately over a period of time, this requirement degenerated into a caste based qualification. The gurus came in all forms, hues and sizes depending upon what the students or their parents were looking for. There were simple school teachers and priests who performed the rituals for the local community but also practiced teaching the local student as secondary occupation. There were scholars specialized in particular scriptures or branches of lower religious knowledge such as performance of sacrificial offerings, construction of the ritual places of worship or performance of certain very rare type of yajnas. There were professional or vocational trainers, heads of the guilds, rich merchants, artisans and adepts in particular fields of knowledge such medicinal plants, medicine, surgery, astronomy, art, architecture or metallurgy, who also acted as gurus, having gained social approval, fame and name through their personal popularity or creative works or the royal patronage. Parents, especially the head of the family, often acted as a guru for the children in the house hold. Kings and nobility had their own line of family gurus, both spiritual and otherwise, who enjoyed a kind of life long exclusive privilege to teach the children of the royal household. And finally there were the highly enlightened, spiritual masters, who lived most obscure lives, shunned the civilized society and remained secluded from the humdrum of the common life. Those who had spiritual yearning would venture out seeking such enlightened masters and serve them for years unconditionally in order to earn their confidence and receive the highest knowledge. Though mostly it was men's show, women also often acted as gurus, rarely in the spiritual world, but generally in selected fields such as art, dance, music, or the art of love making. A guru need not always had to exist physically or in the real world. Sometimes a guru could be a symbolic or religious personality. He could be an imaginary human or celestial being. He could be a personal deity, an idol or image of god or God himself. Whatever the method might be, the most important requirements in the relationship between a student and master were unconditional love, trust and mutual respect. Ekalavya, a tribal warrior, unable to get his personal attention, considered a clay image of Dronacharya as his guru for the purpose of training. He truly believed him to be his guru and practiced archery in front of the image. Because of his immense faith in his method, he succeeded in becoming one of the best archers of his time, second to none actually. The sad part of the story was that Dronacharya was not at all pleased with the behavior of his student and demanded his thumb as a fee in return. The students were expected to spend several years in the service of their gurus, before they became qualified and started on their own. During this time of studentship, they were expected to perform different types of duties and services to their masters and their entire households. Without this service, which also included pure physical labor, it was difficult for the student to get closer to his master and receive his grace and teaching. The Hindu dharma shastras or law books prescribed a strict code of conduct for the students while they served their gurus and received education from them. A student was expected to maintain a dignified relationship with his or her master, surrender unconditionally to his guru, develop unquestionable faith in the teachings of the guru and pay utmost respect not only to the guru but also his entire household including his wife and children. Under no circumstances should a student marry or engage or even think of engaging in improper relationships with the members of his guru's household. A guru subjected a student to different tests before elevating him to the next level of learning, introducing him to a new subject or scripture or declaring him as qualified. The tests were not standard tests that we see in today's schools. They were designed specifically to test each student's capability and skills, depending upon latter's specific individuality, mental and emotional makeup and extent of learning. Once a student joined the school of a guru, the guru had full control over the life and activities of the student until he left the place. At the end of several years of service and personal learning, when the time came finally for the student to leave the master, he or she was expected to pay fees to the master in the form guru dakshina. It consisted of whatever the Guru wanted from the student as a fee: some service, personal vow or promise, any material or spiritual reward or a commitment to uphold a certain school of thought or tradition. And we have already talked about Ekalavya, whom his guru asked to give his thumb as a fees in return for using his image as a guru. 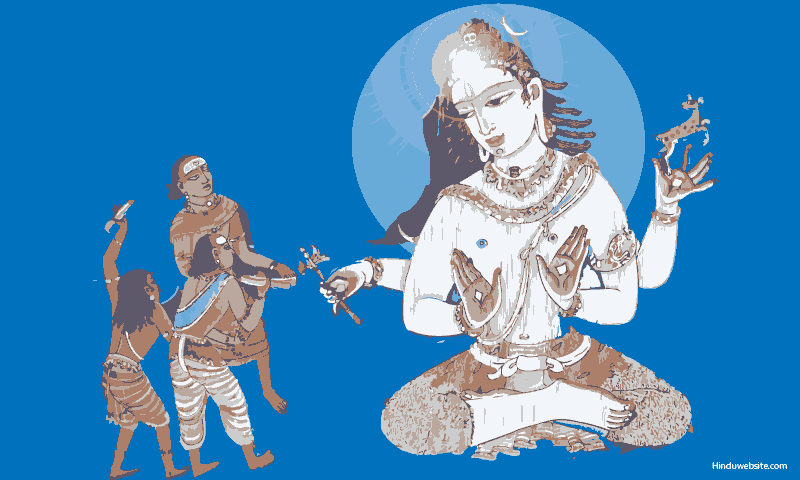 The tradition of master and disciple played a significant role in the preservation of Hindu dharma and the passing of the scriptural knowledge and rich traditions from one generation to another and contributed greatly to survival and continuity of Hinduism even during the most turbulent times. If we have to cite one reason which contributed to the survival of Hinduism for thousands of years, we can confidently cite this particular tradition of guru and disciple. Hinduism did not have a central authority like church to regulate its affairs. There is no one central scripture like the Bible or Koran. There is no particular defense that we can bring in to safeguard the religion from vicious attacks aimed to cast doubt or aspersions or convert people to other faiths. But despite these threats to its survival, if Hinduism continues to be a major dominant religion of the world today, we can attribute the credit to this particular tradition of master and discipleship.